This wonderfully colored lichen was found growing from highly layered and weathered schist at Piestewa Peak, near Phoenix, Arizona, USA in January 2004. 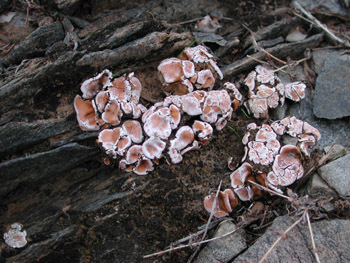 This lichen can be easily recognized by the characteristic salmon/pink color. The squamules of Psora crenata are fairly large (up to 10 mm in diameter) and typically have a central depression. A very similar lichen is Psora decipiens, which also is pink but has smaller, more convex squamules without a central depression. If well developed both lichens have small, black fruiting bodies which look like little buttons on the surface of the squamules. These lichen often grow on the soil in a somewhat hidden crevice. Soil lichens are very sensitive to trampling and nowadays have become much rarer than they must have been before cattle, ORV's and trekkers were introduced to Arizona's rangelands. There are many more soil lichens and other microbiotic crusts like soil algae, cyanobacteria and microfungi which can develop into extensive biosoils if they remain undisturbed.